Quinns: Last year we floated the idea of “Expansion January” or “Expansionanuary”, where we’d start the year by revisiting old favourites and seeing how they’ve been updated. 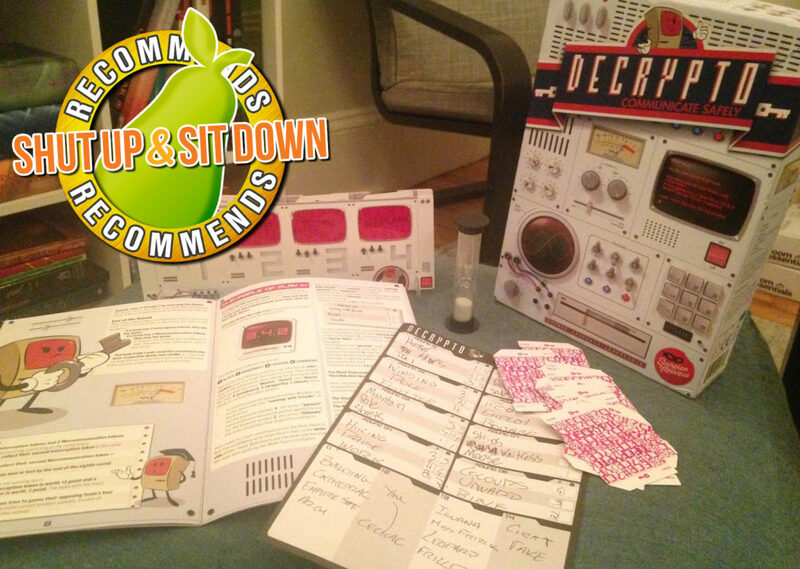 Since you guys weren’t entirely repelled by the concept, welcome to the FIRST EVER Shut Up & Sit Down Expansionanuary. 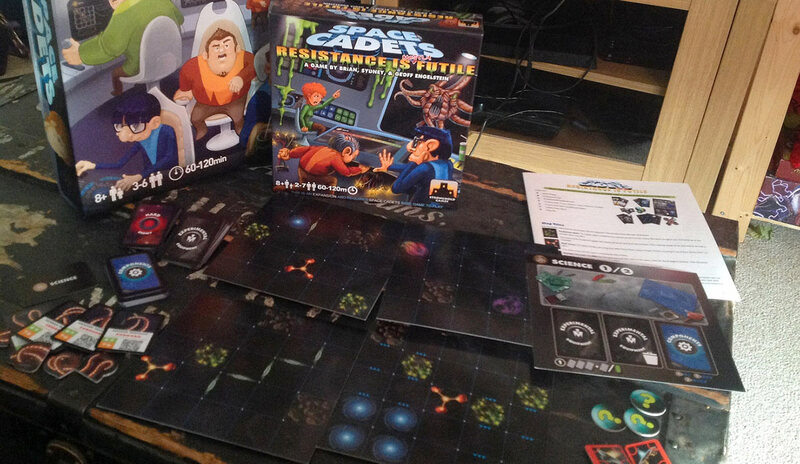 We’re kicking it off with what’s being called the “first” expansion for Space Cadets, Resistance is Mostly Futile. Remember how we first covered Space Cadets with an itemised guide as to why your friends are going to do a terrible job of flying a spaceship together (and then later demonstrated it in a Let’s Play)? 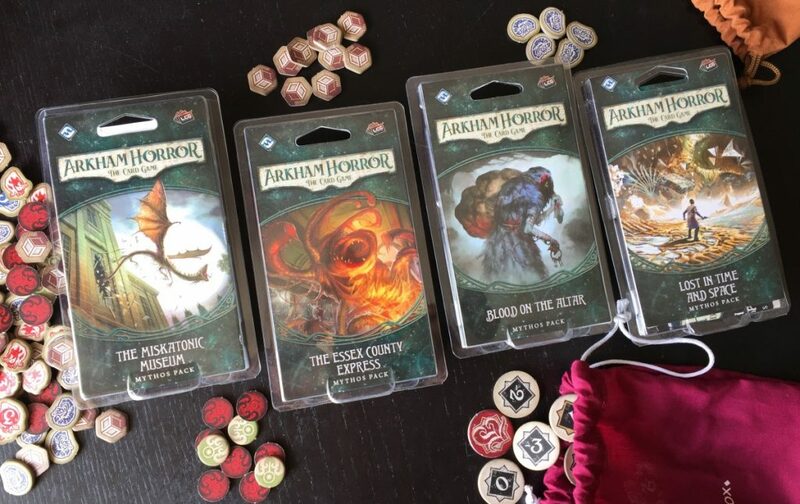 Let’s give you a guide to the new terrors in the expansion! Starting with a new job that nobody’s going to want to do: the Science Station. Space Cadets is a farce. That’s the most important thing to know about it. For the entire game your Weapons Officer will be launching torpedoes like a drunk man trying to hit a bird with a TV. Your Helmsman, after entire minutes spent sweating over his flight stick, will put you half a dozen spaces away from where you wanted to be and facing the wrong way. The Captain will spend the entire game coming up with excuses to Fleet Command as to why you’re back so soon. We’re very happy to say that the Science Station is the most farcical part yet. 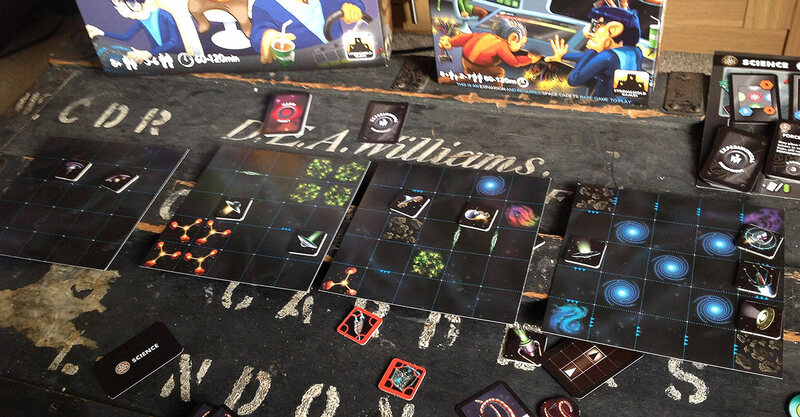 Like everything else in Space Cadets the new “Science” phase takes 30 seconds. It actually gets its very own 30 second “Science Phase” because everyone gets a say in it, even if their advice or panicked requests to stop this madness is roundly ignored. 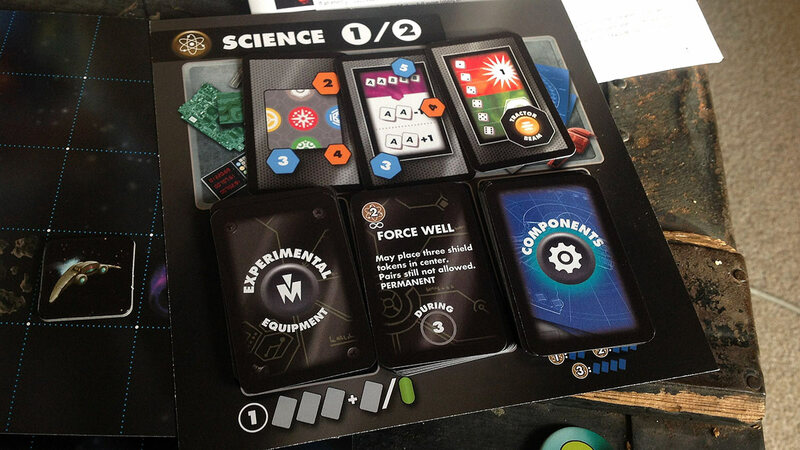 First, the Science Officer draws three cards off the Experimental Equipment deck, each of which will make someone’s job easier (a zippier Jump Drive, enhanced Shields, Nukes, that kind of thing), then they need to select a number of Component cards equal to its difficulty, each of which depicts cards or tokens found in the original Space Cadets. The whole team must then work together gather these components. Doesn’t that sound like fun? The Science officer requesting the Weapons Officer’s L-shaped tetrimino, the Shield Officer’s orange 2, etc. All players can help in this, with the moderately important rule that if you gather all the components in the time limit and unlock the crazy ship upgrade you were working towards, the components you gathered are removed from the game. Now remember that only one player in a game of Space Cadets really understands their station, the Science Officer only has time to skim-read the experimental equipment, and just about every Component card will see one player screaming “NO, NO, I NEED THAT,” with the Captain casting a bamboozled deciding vote. Now imagine the results. A ship with lethal torpedos but can’t turn left. An engine with Neutron Thrusters that can fly incredibly fast… so fast, in fact, that the Helmsman finds out he can’t control it, and from then on is always banging against the sides of the map. A Science Officer proudly presenting the ship with a “Lucky Charm”, hand-crafted from about 50% of your Shield Officer’s station. It’s also very “Space Cadets” that finally, using just a few vitally important parts from across the ship, the Science officer can give you the opportunity to drive in a straight line. For some people this alone will be worth buying the expansion for. We call them “cheats”. I kid. 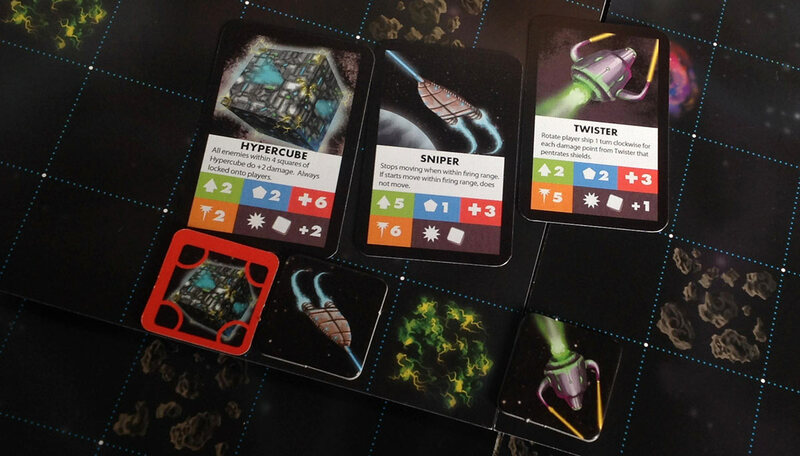 In a surprising move for an expansion but a smart one for Space Cadets, Resistance is Mostly Futile comes with four “historical” missions that do a fantastic job of introducing players to the game. First with a mission that sees you flying a simple ore hauler with the still-simpler objective of running away, then with a staged fight, then a more tactical fight, and finally a tractor-beamin’, lasers-flyin’, exploratory romp in the style of Space Cadets’ original Mission 1, but without the terror of trying to jump to lightspeed at the end using Space Cadets’ Yahtzee-in-a-blender Jumping minigame. Nothing else to say here. Just play these missions. Love them. Love each other. Life’s too short. Apparently some people, somewhere, decided that what they really needed was for Space Cadets to be harder. To me this sounds as mad as fondly wishing that trees were harder, or plates, but if you want to plunge your ship into true terror then missions 7 through 10 will provide. 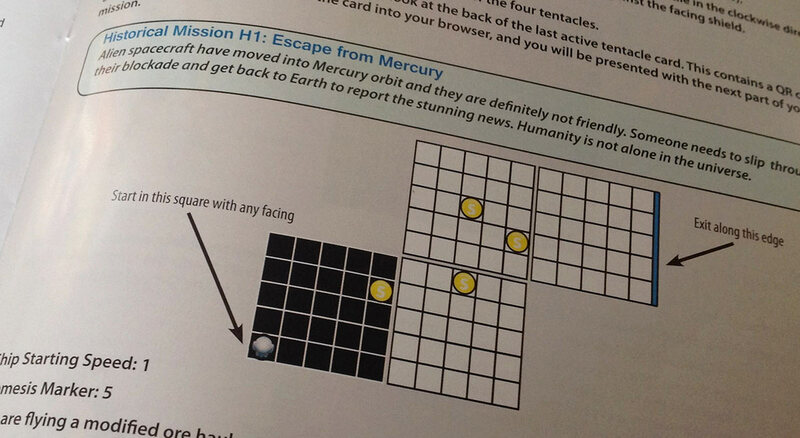 Mission 7 (pictured above) sees you jumping through four increasingly dangerous, cramped tiles, soundly negating Team SU&SD’s favourite tactic of running away. 8 has you commanding a stationary space station against successive waves of ships, which is putting pressure on your Weapons Officer comparable to that of an oxygen canister. 9 is a similar test for your helmsman, as you fly through six tile gauntlet filled with enemy ships with your weapons disabled. WHO WANTED THIS? Finally, in Mission 10 you have a mission of utmost importance. 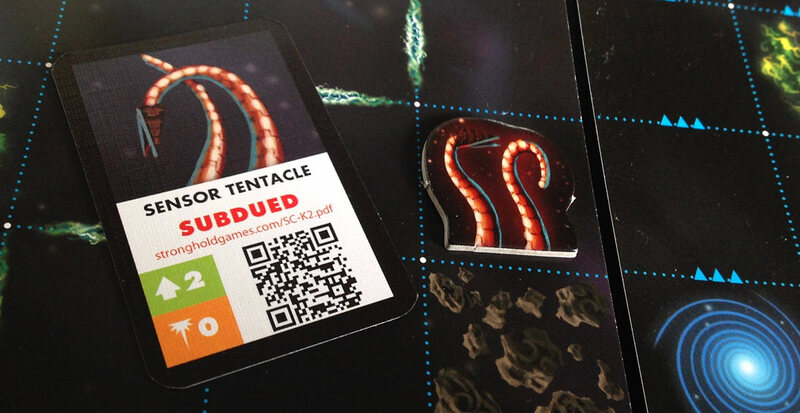 The Xenobiology Division wants you to investigate a STAR KRAKEN, wielding the scariest weapon of all. QR codes. I’d tell you more about the Star Kraken but the precise point of the mission is that you don’t know what this creature is capable of. The QR codes reveal each step of the mission as you try not to get eaten. Resistance is Mostly Futile also comes with a few more enemies and some more map tiles, but these are the things I like the least. They mean that in the course of play you need to reference a second manual for their special rules, and the game gains very little. Play with them if you’ve played so much Space Cadets you’re bored of all the existing enemy ships and gravity anomalies, though I think that refers to about 1% of all Space Cadets owners. 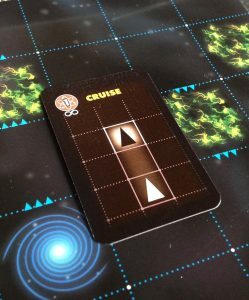 As is often the case with our expansion reviews, let’s quickly bypass people who adore Space Cadets (because c’mon, you know you’re buying this) and people who don’t like Space Cadets (because this won’t change your mind) to plunge straight to people who quite like Space Cadets but don’t often get it to the table. Space Cadets is an overwhelming game to teach precisely because of all the different stations that you have to teach one at a time. It’s like spinning plates, except instead of plates you’re working with your friends’ attention spans, and instead of breaking said plates someone might wander off for a biscuit and never learn how to save your life when there’s a Warp Core breach. Did this game really need another station? No, it didn’t. Then again, Space Cadets has never been a sensible game. It’s about heroics and teamwork and laughter and terror. And Science does succeed at making Space Cadets still sillier and still more terrifying. I love that it’s this quicksand of trying to help, but gently warping the very fabric of the game by creating little vacuums where certain components should be. That’s brilliant. So that’s one reason to buy Space Cadets. 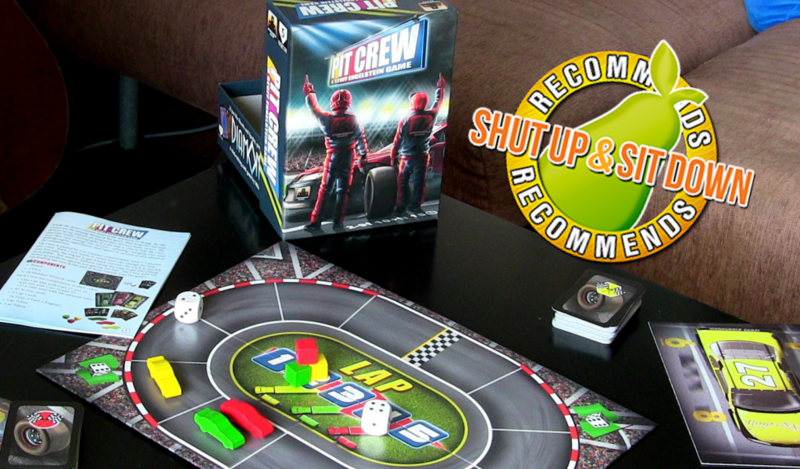 If you love this box because it’s a ridiculous experiment that pushes the envelope of what board games can do, the Resistance Is Mostly Futile expansion pushes that envelope still further with yet another idea that I’ve never seen in any other game. But I don’t know if that’s worth £21. The other good reason to buy this is that the new, easier Historical missions make a full-fledged campaign of Space Cadets, with everybody slowly learning their roles and ultimately mastering the game, a much more plausible feat. That, PLUS the new Science station, PLUS the bizarre later missions to look forward to, is probably worth £21. So if you’ve been eyeing up Space Cadets since our Let’s Play and have a few friends willing to make the effort to finish play every mission in it in a hilarious saga, I’d heartily recommend grabbing both the base game and expansion and putting aside an evening a week until you’re finished with the campaign, whether that’s because you won or because you’ve had your spirits utterly crushed. But for people who feel they’ve already had their fun with the base game? I’d probably recommend saving your money. I don’t think we’re going to be short of new games to buy this year.